True confessions of a recipe hoarder Episode 937. Obviously I do a fair amount of baking and to be honest, sometimes I get a little behind on the sharing of my recipes. 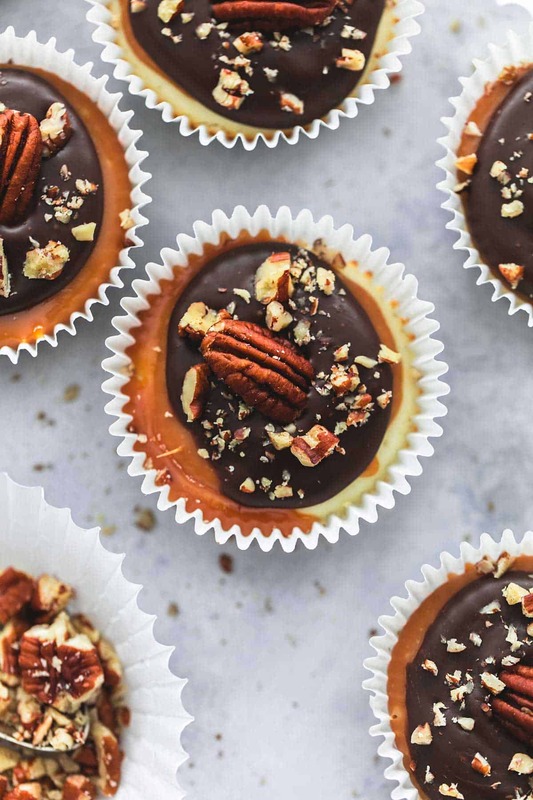 Case in point, these mini turtle cheesecakes. The exact date is a little fuzzy but I’ve been hanging on to this yummy recipe for wayyy too long without sharing it. 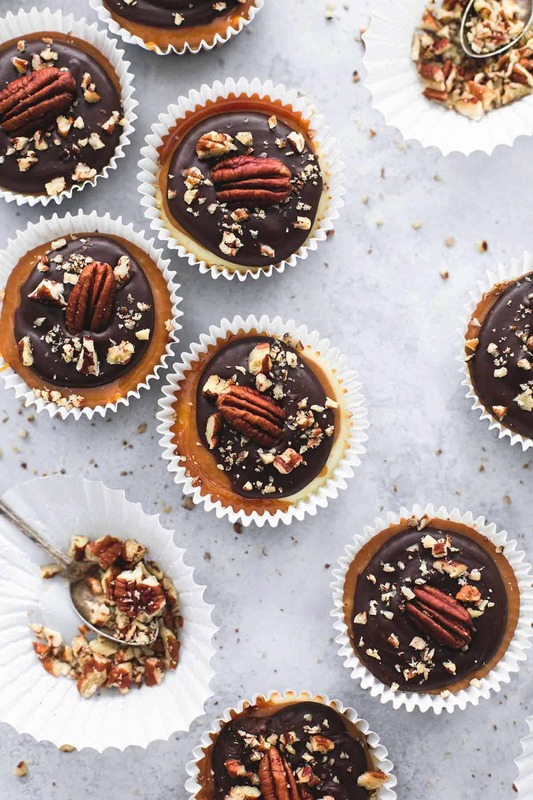 Mini cheesecakes might be my favorite kind of cheesecakes. Maybe that’s because tiny things have cute coming out the wazoo, orrrr maybe it’s because I can eat 12 of them and feel better about it than I would if I ate 4 whole slices of regular sized cheesecake. Probably a combination of the two. These little morsels of sugary heaven are so dreamy. 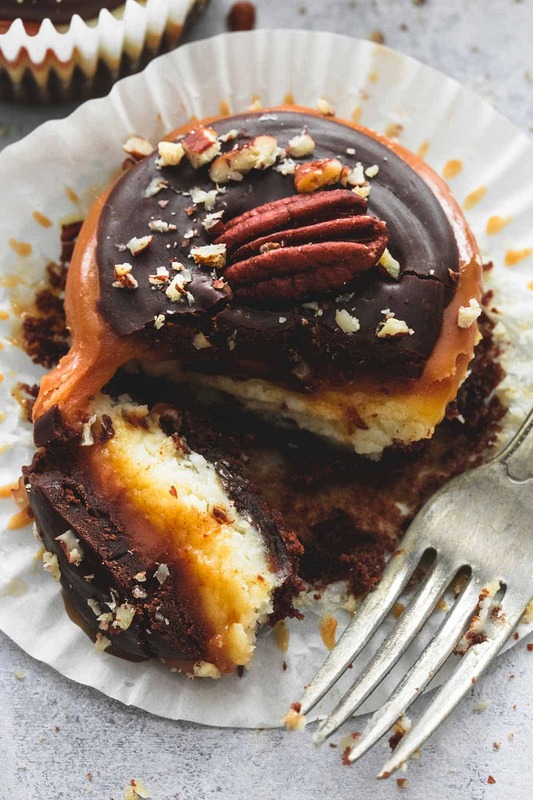 A brownie base with creamy vanilla cheesecake, topped with chewy caramel, rich chocolate, and crunchy pecans. All the flavors of a classic turtle dessert rolled into one little handheld bundle of cheesecake joy. So I’m sorry for the delay in getting these into your life, but trust me when I say they are definitely worth the wait. 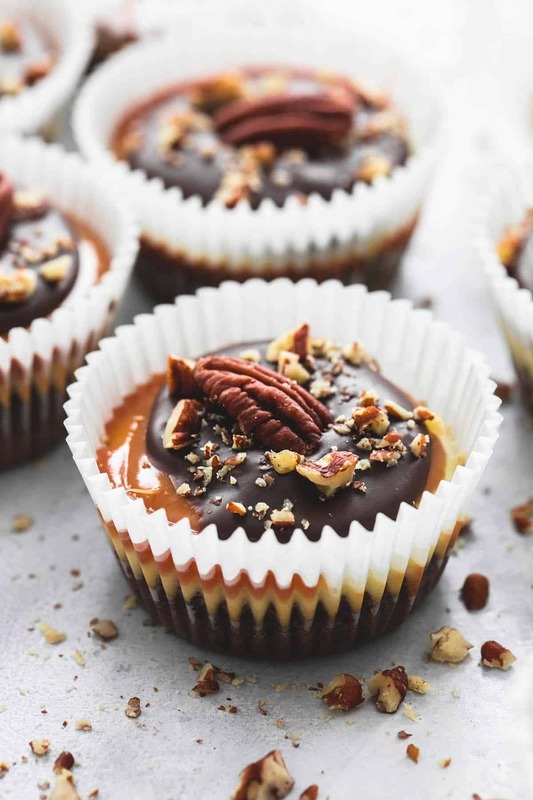 Learn how to make these adorable and delicious mini turtle cheesecakes with a brownie bottom and topped with caramel, chocolate, and pecans. Preheat oven to 350 degrees and line muffin tin with cupcake liners. For the brownie layer, stir together flour and salt in a small bowl and set aside. In a microwave safe bowl combine chocolate and butter and microwave on half-power for 1 minute. Stir and return to microwave for 20 seconds at a time, stirring after each until smooth. In a medium mixing bowl, combine sugar, eggs and vanilla and whisk until completely incorporated. Whisk in the chocolate mixture. Stir in the flour mixture until just incorporated. Spoon the brownie mixture into the bottom of each cupcake liner. Bake for 10 minutes and set aside. Prepare the cheesecake layer by creaming together the cream cheese, egg, sugar, and vanilla until smooth. Fill each liner 3/4 full with the cheesecake mixture. Bake for 20-25 minutes until cheesecake is set. (Just wiggle the pan a little big and if the cheesecake doesn't move much it's done). Allow to cool about 15 minutes. Combine caramels and heavy cream in a microwave safe bowl and cook on half power for 2 minutes. Stir, return to microwave for 20 seconds at a time until smooth. Repeat process in another bowl with chocolate chips and heavy cream. Spoon some caramel sauce on the top of each each cheesecake. Transfer to freezer or fridge for 2-3 minutes, then spoon chocolate sauce on top of caramel. Top with pecans. Serve immediately or chill until ready to serve. I just found your blog today, and where have I been! 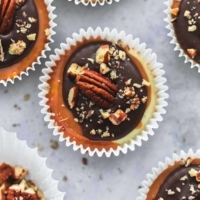 Your recipes are amazing, and these mini turtle cheesecakes are on my must try (very soon) list. You are amazing! Keep up the good work! Can i make these without a cupcake liner? You could try but I wouldn’t say that I suggest it! Could i use a boxed brownie mix FOr the bottom layer? If you want to cheat, then sure! 😉 I’m just joking- sounds like it should work! Definitely let me know the outcome! !